Whenever summer rolls around, driving in your car for long periods of time can become unbearable. The direct sunlight and overwhelming heat can be enough to give anyone a headache. While tinting your windows is the only option, most people are hesitant to have professionals do it. After all, depending on the quality of the tint and the size of your windows, you can spend up to $500 for an expert job. 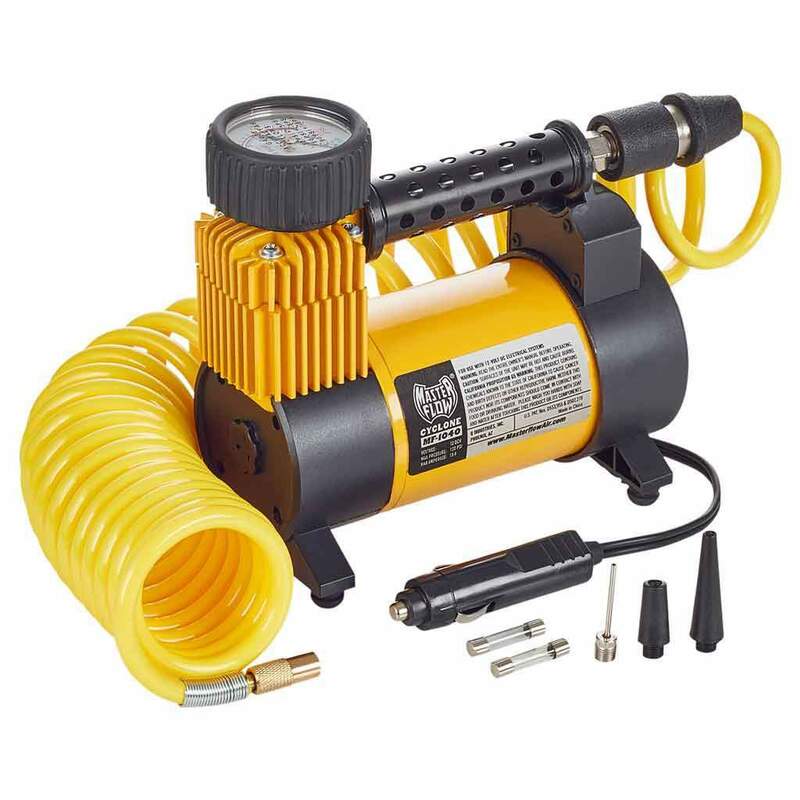 If you are not willing to spend that kind of money, you will be happy to know that there are lots of great, high-quality DIY options. Of course, if you want a tint that will look good and last for a long time, you are going to need the best window tint films on the market. Now you have don’t have to waste any time or effort trying to figure out which the right option for you is. Here, we take a look at some of the best choices and also provide you with tips on how to make your own decision. Tint Level: This is the level of cover that you are afforded by a particular brand. The tint level can be determined by a number of factors including the weather, your preferences, and the laws in your region. Application Ease: Since you will be applying the tint to your car windows yourself, you will need to look for a film that is easy to work with, particularly if you don’t have a lot of experience in such matters. Longevity: You will also need to look at how long a particular tint will last on your car after being continuously exposed to the elements. Total Cost: Last but not least, it is important to think about how much a roll of tint will cost you for all of the windows on your car. Why we like it: The UEi T-view T2bk2036 Window Tint is an excellent choice because it is easy to apply and resistant to a number of environmental factors. If you live in a rather sunny area and need quite a bit of protection from the sun, then this window tint will be quite useful for you. The 20 percent VLT ensures that you will be adequately protected from the harsh rays of the sun while still providing you with enough visibility to stay safe while driving. This is also a great window tint to apply to your car because of all of the protection that you can receive. In particular, this tint works well to shield the interior of your car from heat and UV rays. As a result, they are less likely to blister and fade even in the harshest of summers. Yet another perk afforded by this tint film is the fact that it is quite easy to apply. Even if this is the first time that you are attempting such a project, you should find little trouble in trying to get it done. One of the reasons for this is because the film has been specifically designed to be applied to curved surfaces. So, you will have no trouble gliding it across the gentle curve of a window. Now, it should be noted that this film is a lot pricier than the other options. That being said, you do get a lot for your money. The roll has a width of 36 inches and you get a 100 feet of the material. This makes it an excellent option if you are looking to tint multiple cars and still have some film left over. So, just how long will this tint last? Well, all factors point to it being able to remain on your car windows for quite a while. For one thing, it has been constructed to be resistant to incredibly high heat. So, you will not have to worry about the film bubbling or peeling, regardless of where it is that you live. Why we like it: The Pro-Tint Windows Tint Film Roll gives you lots of high-quality options to choose from and protects the interiors from UV rays. One of the things that makes this tint film roll stand out is that it provides you with a lot of different VLT options to choose from. So, you get to decide between 5, 15, 20, 30, 35, 45, and 50 percent. This is a lot more than what other brands offer up. Due to all of this choice, you are a lot more likely to be able to find a tint that offers the perfect balance between protection and visibility for where you live. As far as protection goes, you will be hard-pressed to find a tint that is able to block UV rays better than this one can. This roll has an anti-UV rate that is as high as 99 percent. What’s more, it also blocks most of the heat that hits the window, making a lot easier to keep the interior of your car cool. If you are a beginner at applying tint to your car windows, then there may be a bit of a learning curve involved. While this film goes on well enough in most areas, it can get a little tricky when it comes to the curved surfaces, as with your rear window. However, it is incredibly easy to cut to fit almost any make and model of car so this part of the process will be largely hassle-free. With a single roll, you will get a film that is 24 inches wide and that is 10 feet long that should be enough for most vehicles. To add to this, it is also quite affordable. What’s great about this tint film roll is that it works quite well even in harsh conditions. So, even it is exposed to bright sunlight day in and day out, it will not fade away. This means that you get to enjoy its tinting capabilities for a lot longer. Why we like it: The Window Film and More Automotive Window Tint offers a light yet protective tint that works well for most moderate climates. Lots of people don’t really like a tint that is too dark. After all, this can make driving a lot more difficult, especially if you don’t live in a region that has to deal with scorching sunshine. If you are just looking for a moderate level of protection then this is the window tint for you. It offers you up 35 percent VLT. Of course, the fact that there aren’t more choices can be a bit dissatisfying. 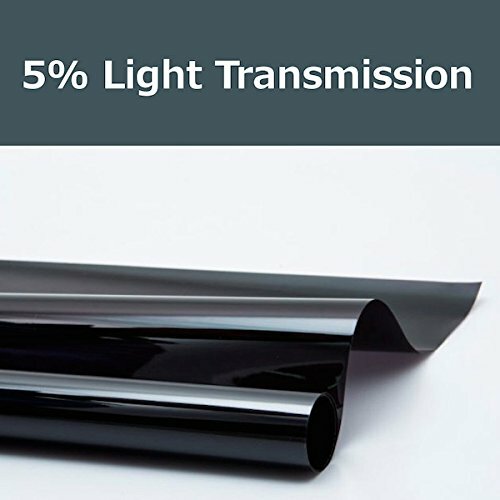 There is no denying that this film definitely provides you with some serious protection as it is able to effectively block up to 99 percent of UV rays. So, if you want to shield your skin even during the brightest and hottest times of the day, this is the film that you should look for. On the one hand, this film tint should be quite easy to apply. After all, it comes with a liner that you simply have to peel off and adhere to your car window. However, this may not prove to be the best film for beginners as you will require some expertise if you want to get the job done properly. If you do know what you are doing, though, you will find that you have quite a bit of material to work with. This roll has a width measuring 22 inches and you get 50 feet of film! So, you really will have no problem tinting the windows of larger vehicles. This window film tint has certainly been built to last you for quite a while. For instance, it is of professional grade so it has a high-quality adhesive. This means that it won’t form air bubbles over time and will remain tightly fitted to the window pane. It is also scratch-proof so you don’t have to worry about it peeling anytime soon. Why we like it: The LEXEN Pre-Cut Complete Tint Kit allows you to get the perfect dimensions for your vehicle for a very reasonable price. You get to choose various tint levels with this option – 5, 15, 35, and 50 percent. Although there is not too much choice for medium shades, there is still a good variety. So, you should be able to find a level that works well in your particular environment. The other thing that stands out about this tint kit is that you are well-protected from the sun. This is because the film is able to disperse up to 99 percent of the UV rays. So, if you live in a region that is known for its hot, scorching sun, this is a film roll that is going to be quite handy for you. One of the main perks of this tint film is that it comes pre-cut. You have to send the measurements in for your car windows and the company will send computer-cut patterns out to you. This means that you are saved a great deal of hassle when it comes to cutting out the film yourself. Now, the premise behind the application process of this film roll is simple. You just have to peel off the tinted portion and apply it to your car window. That being said, you may find it to be a little bit difficult if this is something that you haven’t attempted before. 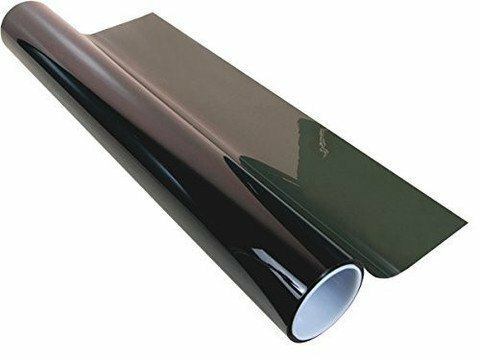 This is a high-quality tint film so it has been designed to last you for quite a while. As such, you don’t have to worry about it fading in the sun. To top it all off, the film is also scratch-resistant so you can rest easy knowing that all of your hard work will be preserved. 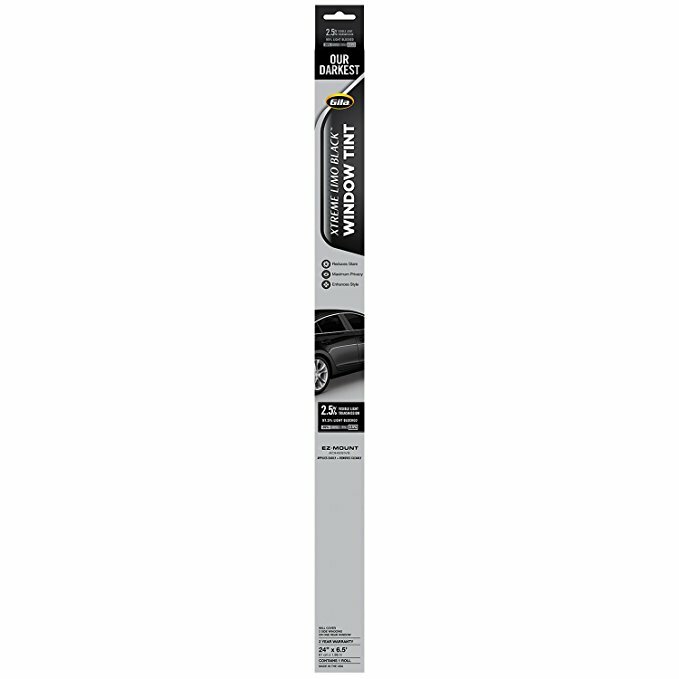 Why we like it: The Diablo Window Tint is a high-quality tint film that holds its color and will last for a long time. With the diablo window tint, you get to choose from four VLT percentages. So, depending on the level of privacy and protection that you require, you can select from 5, 20, 35, and 50 percent. So, regardless of whether you live somewhere with incredibly bright sunshine or whether you live in a more moderate climate, you will be well served. Unfortunately, in terms of protection, this film tint doesn’t offer up a lot. While it does block out the sunshine, there is no definite proof that it is all that effective against UV rays. Considering how much it costs, this can be a bit of a disadvantage. There is no denying that you do require a little experience if you are going to be applying this film yourself. This is because it does have a tendency to crinkle while you are working. However, it is quite forgiving so your end result should look quite good. One thing that is definitely positive with this film is that you get quite a lot of it. First of all, the width is quite impressive at 36 inches and you get a 100 feet of the material. This means that you can easily apply the tint to vehicles with larger windows. This does justify the price to a certain extent. If you are looking for a window tint that is going to last you quite a while, then you should definitely consider this one. It has been designed to not fade so you don’t have to worry about your tint turning an odd purple color after being left in the sun. Why we like it: The Tint Your Own Car Tint Kits are provided you with pre-cut sections, ensuring that your DIY tinting process goes a lot more smoothly. There is a decent variety of tint levels to select from in this kit. You can pick from 5, 20, 35, and 50 percent. So, while there aren’t too many moderately tinted options, you should still be able to find one that fits your needs quite well. Now, there is no UV protection or any other protection mentioned with this tint film. So, while you can opt for some incredibly dark tint levels, it isn’t clear just how much protection that you can expect to gain from this particular film. Perhaps one of the best things about this tint kit is the fact that all the film sheets arrive at your doorstep pre-cut. This includes all the smaller or larger windows that you may have on your vehicle. Not to mention, they are able to provide films for a wide variety of make and models of vehicles. What’s also great about this product is that it comes with instructional videos on how to apply the tint to the windows. So, even if you have never undertaken a project like this, you will find that it is quite easy to manage. This allows you to justify the higher price a bit. This is definitely a tint film that boasts higher quality. As a result, it will not peel or bubble, even when it has to endure extreme weather conditions. On top of this, the film will not fade so there is no chance of it turning purple after a while. The only thing that really offsets this quality is the fact that the shipping method isn’t great so the package can arrive at your doorstep, damaged. Why we like it: The VViViD Colorful Car Window Tinting offers you lots of colors to choose from as well as a great deal of protection from the sun. Now, one of the downsides of this window tinting film is the fact that there isn’t actually a VLT attached to it. It is available in a variety of colors including black, green, yellow, pink, blue, and orange. While these all afford you a good amount of privacy, it is difficult to determine just what percentage of shade it actually is. However, this film definitely provides you with a lot of protection. This is because, in addition, to blocking the glare, it also works to protect you from UV rays. You can expect about 99 percent of harmful UV rays to be dispelled with this tint. One of the main advantages of this car window tint is the fact that it is incredibly simple to apply to your windows. All you have to do is to peel away the tint from its liner and you can fit it onto your window quite quickly. Of course, you should be aware that curved surfaces may prove to be a bit tricky to deal with. As far as width and length go, you don’t get too much with this particular product. You do get two rolls that each measure 30 x 60 inches. While this should work for most smaller vehicles, you may find that you are a little short when it comes to larger windows. Not only is this tint film easy to go on, it also stays on once it has dried. So, there is no need to worry about this film peeling away all that soon. To top it all off, this film ensures that dirt, grime, or dust doesn’t stick to it, making it quite easy to maintain. 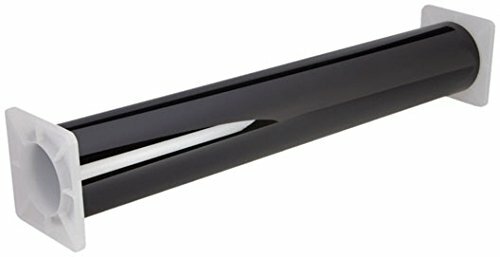 Why we like it: The Black Magic Insta-Cling Jumbo window tint is an affordable window tint that is incredibly simple to apply to your car windows. 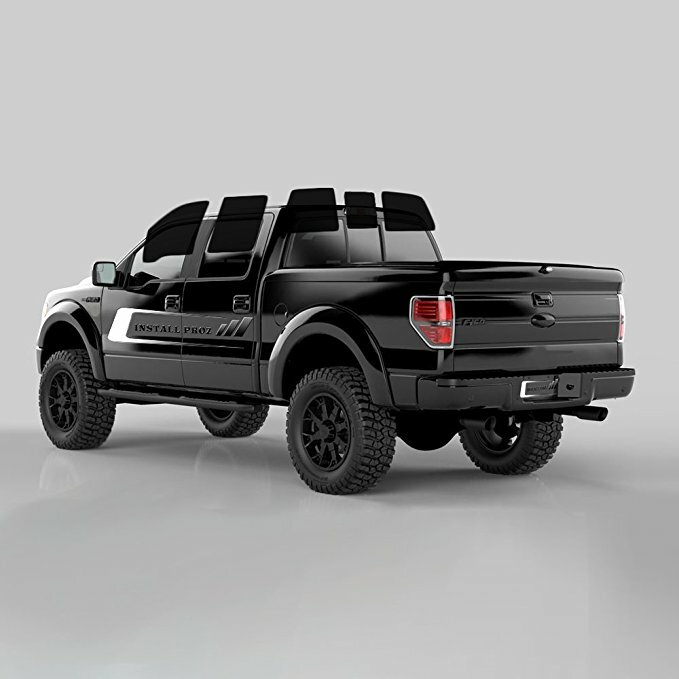 The Black Magic window tint offers up two levels to choose from – 5 percent and 20 percent. This makes this an excellent brand for anyone who is looking for a considerably darker shade to ward off harsher and more powerful sunlight. So, if you live in an area where the summer gets quite intense, this could be for you. On the other hand, this does mean that there aren’t all that many shades for you to choose from, especially if you don’t want something so extreme. There is no protection specifically mentioned for this tint film so it is difficult to know just how much it protects you from UV rays. However, the depth of the color does work quite efficiently to block most of the rays. This is certainly the easiest of all the tint films to use on your car. This is because while many of the other brands use some form of adhesive, this film relies on static. So, it can quickly and easily be placed on your windows without any fuss. Even if you were to make a mistake, it can be remedied in a matter of seconds. Now, you don’t actually get a lot of material in one package. The dimensions of one roll are 28 x 78 inches which should work well for small windows but not larger cars. The good news is that it is affordable enough to buy more than one roll at a time. Although it may not seem like it, this tint film actually has a lot of staying power. What’s more, it has been proven to not bubble or peel, even under extreme temperatures. What’s more, it even has a scratch-resistant coating that increases its lifespan even more. Why we like it: The Gila Xtreme Automotive Window Tint is perfect for anyone who is looking for that extra coverage and wants to make the tint as dark as possible. This automotive window tint has a 2.5 VLT percent. Considering that most brands only go as high as 5 percent, this should give you some idea of how dark the tint actually is. If you are looking for the utmost privacy or want to keep your car interior incredibly dark and cool, then this is the film that you need. Now, the brand does have other shade levels but this one stands out because of its color depth. As you can imagine, since there isn’t a lot of light getting through, there is not a lot of UV rays being transmitted either. This tint is able to dispel about 97 percent of the glare on any given day. While this isn’t the most difficult tint to apply to your window, it may not be all that easy for a beginner to manage. This is largely due to the fact that you have to apply the tint to the windows rather carefully if you want to avoid trapping air bubbles underneath the film. Also, one of the snags that you may encounter is that on curved glass, the application can prove to be tricky. Now, you don’t get too much out of one roll with this tint film. It measures at 2 feet wide and 6.5 feet long. So, depending on the car that you are tinting, you may need more material. Fortunately, it doesn’t cost too much so you won’t break the bank ordering another one. The area that this window tint film definitely holds up is with its lifespan. It continues to function well in incredibly bright sunlight and you definitely don’t have to be concerned about it fading or turning purple. 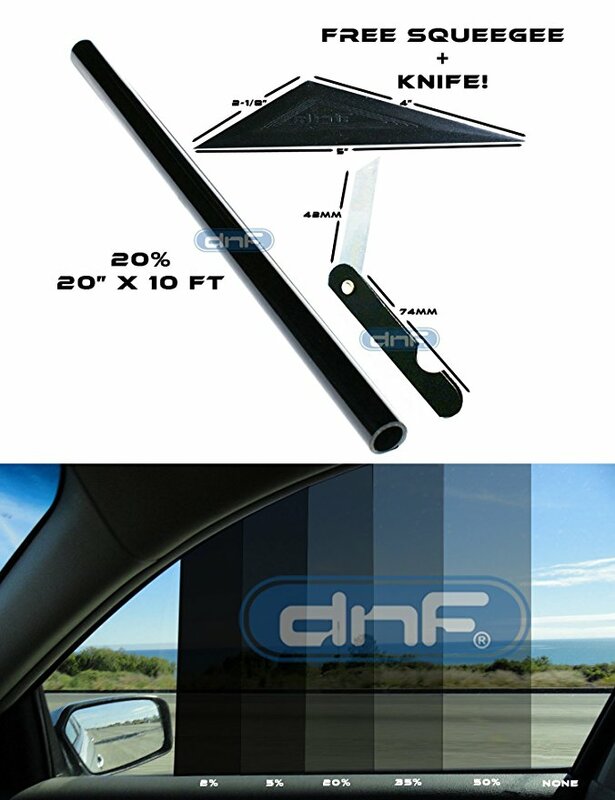 Why we like it: The DNF Window Tint is an incredibly durable film that offers you a lot of variety with shade and protection. With this window tint, you get to choose from 5, 20, 35, and 50 VLT percent. While this isn’t as varied as some of the other films, it does hit the mark. So, you should have enough choice to help you stay properly covered in both extreme and moderately sunny situations. You don’t just get to enjoy lots of shades to choose from, though. You also have the option of determining the level of protection that you want. This includes being able to limit UV transmission and heat transmission that you are exposed to while you are in your car. In addition to keeping you safe from the harsh rays, you also get to stay cool the entire time you are in your vehicle. One of the drawbacks of this window tint is that it can be quite difficult to apply if you don’t what you are doing. This is because it has a tendency to form bubbles underneath the film surface if you don’t stick it onto the window quickly enough. You also don’t get too much in one package. The film measures about 20 inches in width and you get about 10 feet in material. If you are trying to cover a large surface area, this may not be enough. The good news is that it is quite affordable and so it isn’t too expensive to get another roll. Where this window tint really stands out is in its durability. It works incredibly well in extreme climates and you will not have to worry about fading at all. So, there is no chance of your window tint turning purple after being left in the sun for too long. In this section, we will look at all the details and features that you will need to think about before choosing a film that is ideal for you. Perhaps what is most important to keep in mind when choosing a window tint film is the laws that you have to adhere to. See, each state has its own regulations about the level of tint that is allowed. For instance, in certain regions, you aren’t allowed to tint the entire windshield. Instead, you can only have a tinted area of about five inches, on the topmost part of the glass. In other places, though, you can tint the screen but you still have to allow a great deal of light to come through. You should also note that the laws regarding how much tint you can apply to each glass – side glasses, rear glasses, etc. differ as well. It is important to understand all of the restrictions in place to avoid getting a fine. So, when in doubt, always check with your local authorities to determine just how much tint you are allowed to use on your car windows. 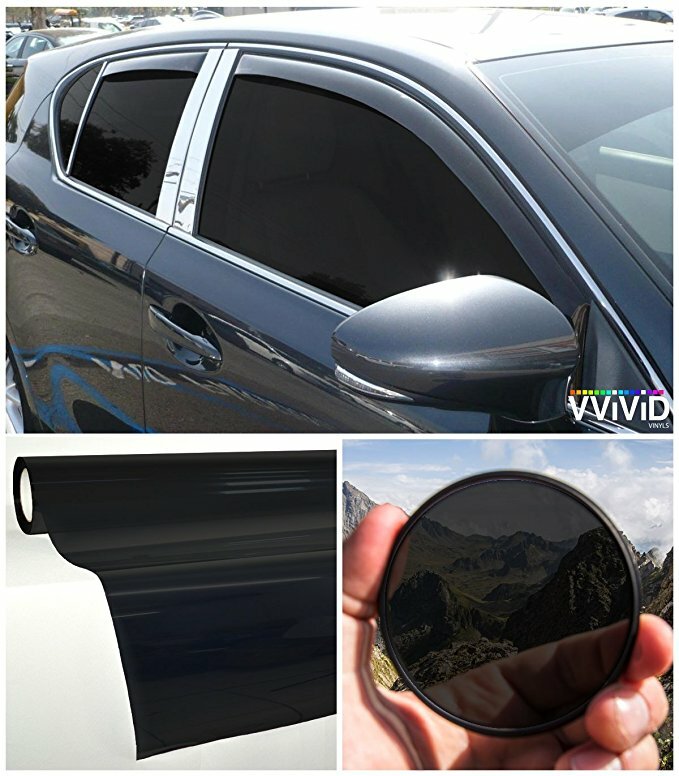 Undoubtedly, one of the most important aspects of window tint film is the VLT. Now, before deciding which one you need (within the limitations imposed by the law), you first need to understand what it is all about. VLT refers to just how much light a given tint lets into the car. So, a higher percentage VLT like 50 percent means that 50 percent of the light is being let in. Typically, 5 percent is about as high as you can go. 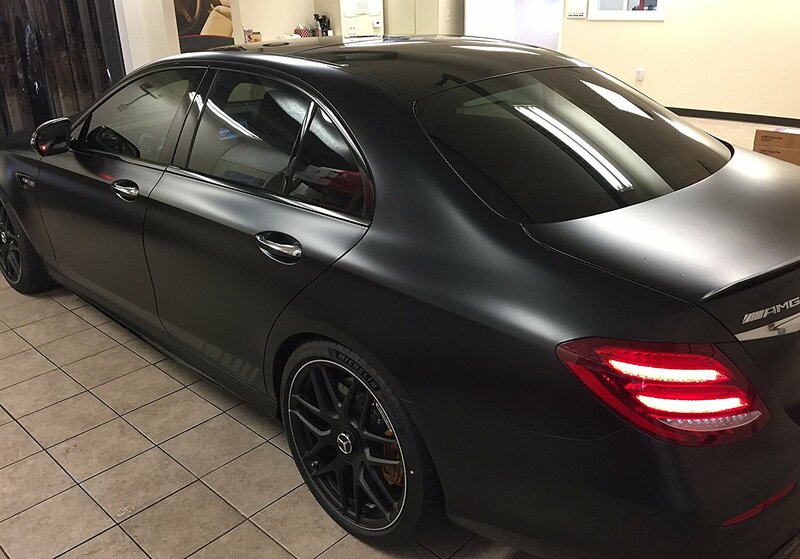 This is often referred to as the limo tint as it lets in very little light. Therefore, when choosing a window tint, you will need to make a decision based on how much light you want to block out. Then there is the matter of UV protection. 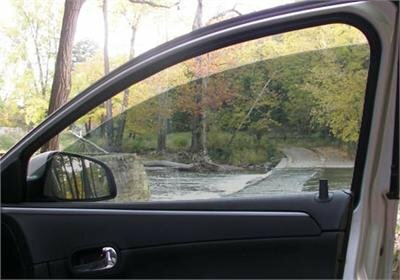 Just because a tint is able to limit the amount of visible light that enters your car doesn’t mean that it can protect you from UV rays. Now, you may be wondering whether you actually need this level of protection. Well, the answer would be dependent on your driving situation. For instance, regardless of whether you live in a sunny area or not, you are constantly been exposed to UV rays. Even on cloudy days, these rays are able to reach your skin. They can cause a variety of issues from causing dark spots to increasing your chance of developing skin cancer. If you are someone who spends most of their day driving in their car when the sun is at its harshest, then UV protection is recommended. If you live in an area that gets a lot of sunlight, there is a good chance that the temperature is quite unbearable as well. As a result, your car probably heats up rather quickly during the day, particularly when it is unattended. To avoid this, you should look for window tint films that disperse the heat rather than absorbing it into the glass. 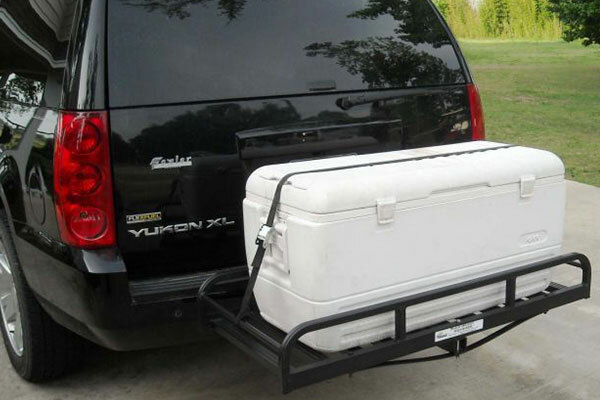 This way, you will find it a lot easier to keep your vehicle cool. One of the most daunting aspects of opting for the DIY window tint option is actually having to carry out the application process by yourself. Unless you have some experience in this area, there is no denying that it can be a tad bit tricky. There are typically two types of window tint films that you can select from. The first comes with an adhesive backing that has a liner. The other relies on static energy to adhere to the car window. As you can imagine, trying to deal with a large sticky slab of thick paper can be rather difficult. Not to mention, the way that these papers stick to the window can mean that air bubbles are more likely to form if you are not careful. At the same time, these adhesives also ensure that the tint is able to stick to the car window a lot better. So, these often have a better lifespan since they will not be peeling off anytime soon. This can’t always be guaranteed with the static window films as in many instances, these types are actually removable. However, this is a great option for beginners. For one thing, this type of film is incredibly forgiving. Even if you were to make a mistake, it is simply a matter of peeling the tint away from the glass and reapplying it in a different manner. Under the same umbrella of application, you will also have to decide between a film that you have to be cut by yourself or opt for a pre-cut option. With the latter, you send the precise measurements of your various car windows to a company and they send back film that has been cut precisely. This can save you a great deal of time and hassle. The issue with this, though, is that there is no room for error. So, if you make a mistake with the measurements or the company sends you the wrong dimensions, it is a whole other process to deal with. Now, cutting the pieces out yourself does require a lot of effort and precision. However, you can be quite certain that you will get the right measurements. If you decide to go with the self-measurement route, then it is important to remember to get enough of material to be able to tint all of your windows. These days, you don’t just have to stick with shades of black for your car tint. 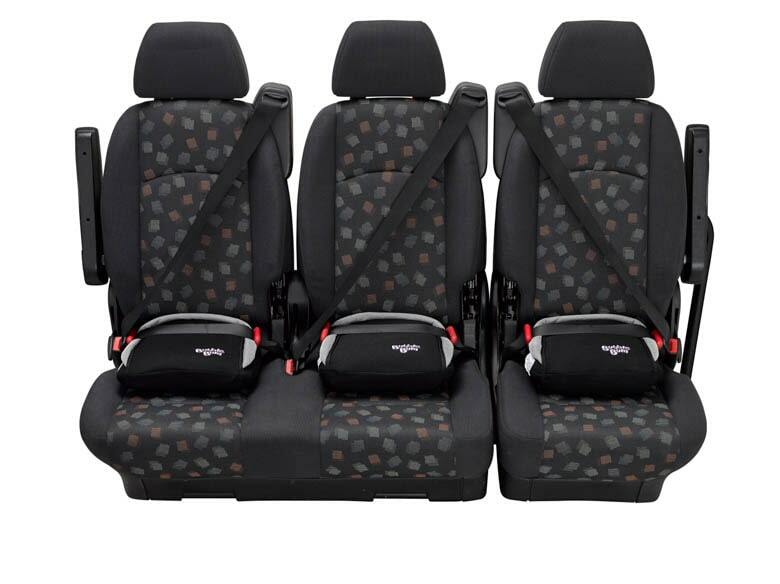 You can choose from a wide variety of colors such as grey, amber, green, blue, and more. This lets you add some character to your car while still keeping you well protected. Now, when choosing these differently colored tints, it is important to apply the same rules as the black tint. This includes aspects such as VLT, UV protection, and heat dispersion. This way, you will be able to enjoy the same benefits as with a black tint, while having a refreshing pop of color at the same time. So now you know all the various aspects of finding the right window tint film for yourself. If you don’t want to go through all this hassle, just consider one of the brands we have chosen for you.